Atlanta Bathroom Remodeling is a wholly-owned subsidiary of the Source One Construction Group and is entirely dedicated to top quality residential bathroom remodeling. Serving the entire Atlanta, Georgia metropolitan area, Atlanta Bathroom Remodeling is an organization that strives to exceed the highest construction-related expectations of today’s Atlanta residential homeowners. We are committed to excellence in craftsmanship and place high importance upon communication with every client. Your vision with regards to the final bathroom construction is of paramount importance to us. We genuinely want everything to be perfect for you and your family. We will make sure that every detail is per the exact specifications that are discussed with you. The Atlanta Bathroom Remodeling design team will hand pick every component of your dream bathroom with you, piece by piece. We want you to be happy with every detail and will supply you with a formidable selection of bathroom options to choose from. Bathroom remodeling is one of America's most popular major home improvements. Everyone loves a beautiful bathroom, big or small. Not only does a new bathroom remodel enhance the beauty of your home, it also enhances your lifestyle. A fresh new look with custom finishes and personal touches will brighten your home life and increase the overall value of your property. Whether you love Classic, Retro or Modern bathroom styles, Atlanta Bathroom Remodeling will provide you with a wide selection of bathroom elements to choose from. Using only top quality products with the best warranties, we will custom configure your bathroom and employ expert fixture and plumbing installation methods. 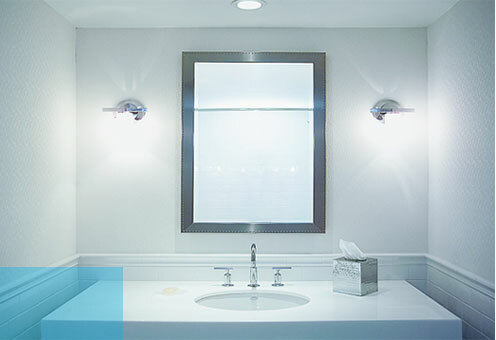 The Atlanta Bathroom Remodeling Crew will bring your bathroom into the 21st Century! With more than just a shiny white sink to choose from, you may select a pedestal sink, console table sink, vanity, vessel or even wall mounted sinks with high style. Bathroom flooring and tile will certainly compliment the overall look and flow while integrating durability. Most people notice a beautiful tile floor as it shines and sparkles so perfectly. You can completely customize your flooring and tile design with ceramic, mosaic, stone, concrete, linoleum or laminate and vinyl tile- or even with rich hardwood flooring. Finally, who doesn’t enjoy an invigorating shower or a relaxing bath? Atlanta Bathroom Remodeling will provide you with a wide array of bathroom shower stall options, thick glass shower enclosures, tile bench seating options, multi-head cascading shower solutions, whirlpool and infinity/overflow style tubs, claw foot free standing bathtubs, even copper bathtubs. Whatever your taste or decorating style, Atlanta Bathroom Remodeling has the right solution for you. Whether you are looking for soft and romantic or bold and striking, or somewhere in between, we will deliver solid construction, variety of options and high quality finishes. We know that there are many companies out there to choose from when it comes to bathroom remodeling. Atlanta Bathroom Remodeling appreciates the opportunity to build you the perfect bathroom, according to your exact specifications, at the very best price.